All three original X-Men films will arrive on 4K at the end of the month. 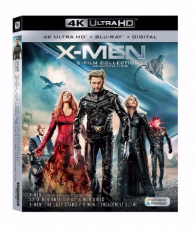 As previously reported, 20th Century Fox is preparing X-Men Trilogy for 4K Ultra HD Blu-ray on September 25. Relive the original X-Men excitement with the first three films starring Hugh Jackman and Halle Berry. Follow the group of mutant outcasts as they learn to control their powers in the first X-Men. Then, watch as the X-Men join forces with their enemies to save all mutants in X2: X-Men United. Finish the trilogy with X-Men: The Last Stand, as the discovery of a “cure” for the mutation starts a war. Specs have yet to be revealed, but supplements will include: Audio Commentaries, Behind-the-Scenes Footage, Deleted/Extended Scenes, The Mutant Watch, Animatics, Character and Production Design Stills. You can find the latest specs for X-Men Trilogy - 4K Ultra HD Blu-ray linked from our 4K Blu-ray Release Schedule, where it is indexed under September 25.